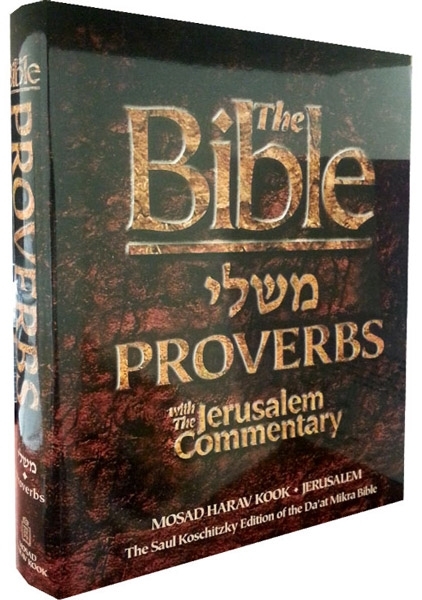 The Jerusalem Commentary, which is an English translation of the Hebrew Da'at Mikra commentary on the Bible published by the Rav Kook Institute in Jerusalem, is one of the most important contemporary biblical commentaries. It is written in the spirit of the traditional Jewish interpretation as reflected in the writings of the classic commentators of past centuries. Its contribution to modern scholarship reflects important new knowledge in the fields of archaeology, history, geography, zoology, botany, geology, and especially the philosophy of ancient Semitic languages. The Jerusalem Commentary is a commentary of the Land of Israel. Composed in Israel, it pays particular attention to the geography, landscape and natural environment of the country, which forms the backdrop of the Bible. Cities and sites are pinpointed on maps. Photographs, sketches and descriptions of flowers, wildlife, musical instruments, archaeological finds such as documents, coins, and utensils of daily life, all breathe fresh vitality into the biblical text. The emphasis on the realia of the daily life described in the text does not, however, diminish from the eternal encounter between God and man, nor from the universality of the human drama that is the essence of the Bible. 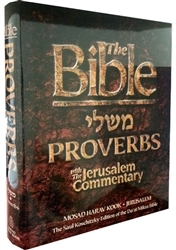 Preceded by a comprehensive introduction, and containing a glossary of names, technical terms and expressions used in the commentary and notes, this edition of the Book of Proverbs with a new English translation and commentary, offers the English reader fresh perspectives and new insights into this ancient and rich text.